190 pages | 8 B/W Illus. 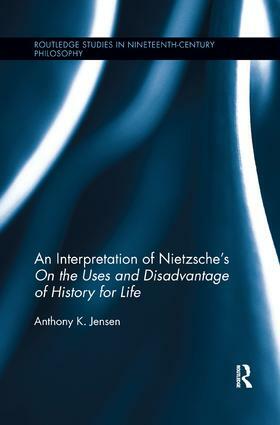 With his An Interpretation of Nietzsche’s "On the Uses and Disadvantage of History for Life", Anthony K. Jensen shows how 'timely' Nietzsche’s second "Untimely Meditation" really is. This comprehensive and insightful study contextualizes and analyzes a wide range of Nietzsche’s earlier thoughts about history: teleology, typology, psychology, memory, classical philology, Hegelianism, and the role historiography plays in modern culture. On the Uses and Disadvantage of History for Life is shown to be a ‘timely’ work, too, insofar as it weaves together a number of Nietzsche's most important influences and thematic directions at that time: ancient culture, science, epistemology, and the thought of Schopenhauer and Burckhardt. Rather than dismiss it as a mere ‘early’ work, Jensen shows how the text resonates in Nietzsche’s later perspectivism, his theory of subjectivity, and Eternal Recurrence. And by using careful philological analysis of the text’s composition history, Jensen is in position to fully elucidate and evaluate Nietzsche’s arguments in their proper contexts. As such Jensen’s Interpretation should restore Nietzsche’s second "Untimely Meditation" to a prominent place among 19th Century philosophies of history. Anthony K. Jensen is Associate Professor of Philosophy at Providence College and Associate Editor of the Journal of Nietzsche Studies. He is the author of Nietzsche's Philosophy of History (Cambridge University Press, 2013) and, co-editor, with Helmut Heit, of Nietzsche as a Scholar of Antiquity (Bloomsbury, 2014).